After days of planning and packing, I forgot the boots. My wife Amy and I had driven out to Cape Cod, in order to follow the footsteps of Henry David Thoreau. “Some locals suggested sneakers anyway,” I said dubiously, to comfort Amy and calm myself. Of course, Thoreau had no hiking boots, and wore low, slipperlike shoes, similar to modern sneakers. But he did often complain of the constant necessity of emptying sand from them, and his feet and mind were tough as old hemp rope. Therefore I had convinced both my wife and myself that we had to get out into what wild remained and see things in a new way, get rid of the “stage coach views” that Thoreau despised. Unfortunately, as I planned this unusual summer vacation, I found walking the Cape not so easy. There is no camping on the National Seashore, nor are there motels or inns along the Atlantic beach. Unlike some mountainous regions of America, these beaches and dunelands have no marked, permanent trails. On the other hand, the booming tourist industry makes other sections unsuitable for anything but driving a car. Luckily, a few people had hiked sections of the Cape, if not the whole thing, and I was able to cobble together a long, zigzag trail. As I studied Thoreau’s Cape Cod, I wondered if anything remained that he would have recognized. Was true exploration impossible? We drove the long highway from home through a misty June rain. Heading off the larger road at Barnstable, we wound around the Old King’s Highway past ancient hickories and beeches. In the foggy harbors rain-suited fishermen puttered around in small boats. We stopped at the Parnassus Book Service, named for the Christopher Morley novel, and built into a nineteenth century general store. The old veteran who ran the place gave me a discount and said, “I’ll just overcharge the next person who looks like he voted conservative!” He had run this book store since 1960, including an outdoor book stall where patrons were encouraged to take books and leave money at any time of day or night. We left this unique shop and devoured cupcakes at Buckie’s Underground Bakery before reaching the Salt Pond Visitor’s Center to pick up a National Park map, still very much in tourist mode. The next morning we woke early and discovered a blinding nor’easter, swirling in from a cold front in the Atlantic. By the time we dressed and organized our two backpacks the rain had calmed somewhat. But the wind swept fiercely across the parking lot, and warnings of a high surf and dangerous tides thwarted our original route up Nauset Beach. Fourteen-foot storm surges the evening before had apparently destroyed many shorebird nesting sites and continued to hammer much of eastern Massachusetts. Thoreau himself had warned of walking these beaches, saying it was “dangerous walking under the bank, when there was a great tide, with an easterly wind, which caused the sand to cave.” That exactly described our dilemma. So, we picked up our walking sticks and took the Cape Cod “rail trail” on day one of our expedition, feeling very little like explorers. A path led from the back of the hotel into a sandy forest. After a wrong turn, Amy found the arrow path of the trail. Thoreau had never seen the train, which arrived two decades after his journeys. It helped turn the Cape into the tourist destination it is today. The straight and level path sometimes carved through dunes and sometimes leaped up on a causeway above ponds and marshes. A mix of pitch pine and oak species vied for dominance over a hoard of smaller plants. Many were covered with epiphytic moss, and as Thoreau mentioned, “a yellow lichen-like rust.” There were not so many trees in his day, though. He described these “plains of Nauset” as something similar to the “rolling prairies of Illinois,” treeless and inhospitable. Passing Bracket Road, I looked sadly at our proposed route, down to Nauset Light and along the empty sand to Marconi Beach. It was just too dangerous today, and I thought of poet Sylvia Plath, who nearly drowned in a rip current at that very beach. The whole project seemed doomed from day one. “We’ll have plenty of beach walking tomorrow,” Amy assured me. Only a few others braved the sodden trail. A small girl riding her bike furiously, on her way to work. A man with a Jack Russell terrier who laughed, “Nice weatha isn’t it?” I reminded Amy that Thoreau had also walked this area as it “blowed hard with mingled mist and rain,” using his umbrella liberally. Horseshoe prints in the wet sand took us back to an earlier time. My wife’s blue eyes questioned the world, surely attempting to see it as an explorer would. She encouraged me to stop and identify plants, even though 30-mph wind and pelting rain urged us onward. Bearberry bushes, earth stars, and reindeer lichen covered the margin of the path, with an occasional blueberry bush or beach rose. Thoreau saw them all, except the beach roses, which migrated along the coast later. We spotted a kettle pond, scooped out of the earth by receding glaciers, and I mentioned that Walden Pond itself was just such a phenomenon. 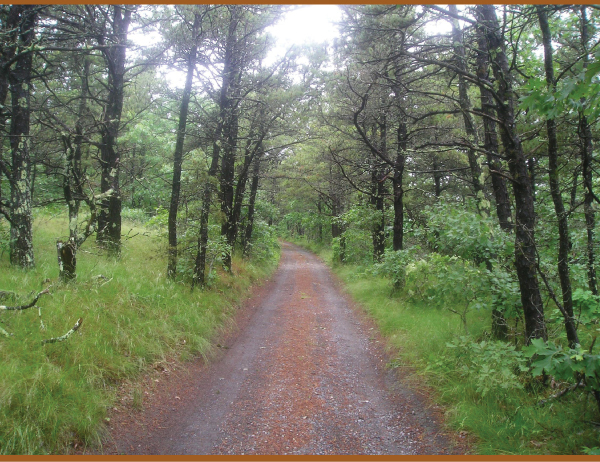 Robins and catbirds skittered across the path, leading us to the end of the day’s journey at Marconi Beach Road. A lunch of Wellfleet Seafood Stew warmed my soaked skin, and I hoped I wouldn’t get sick on the clams as Thoreau had. He had also eaten apple sauce and doughnuts, but unfortunately they were not on the menu. Amy and I spent the next several hours attempting to dry our clothes. We had not seen the Atlantic yet, and ignoring the weather report tried to look forward to the next day. The following morning we woke, packed, and dressed. A quick breakfast in the motel lobby and we lurched out into the mist. After a short walk past the old mile markers on the rail trail, we turned right into Lecount Hollow. Reaching the beach, we prepared our hearts. As Henry Beston, author of classic memoir The Outermost House said, “A first glimpse of the great outer beach of Cape Cod is one of the most memorable experiences in all America.” Instead, we drew back in disappointment. The incoming tide seemed unusually high. I pointed to where it lapped the edge of the dunes, with high tide still an hour away. Apparently, hectares of sand had been lost the previous two nights. We soldiered along the road for three more miles, seeing, or rather identifying, bayberry for the first time. But as Thoreau said, “the ocean was the grand fact there, which made us forget both bayberries and men.” Struggling up the long hills at the top of the dunes, we stopped at overlooks to scout the forsaken sands. A sudden squall drenched us, and we hid miserably under an oak until it passed. Finally, the road ended at the last beach in Wellfleet and we collapsed on plastic in the lee of a wall, eating dried fruit and reading. I checked the tide several times, but it splashed the clay cliffs regularly. “Well, you promised an adventure,” Amy told me wryly. Finally, seeing no hope of the raging waters receding in the near future, I discovered a seldom-used path along the grassy dunes and made a slow way through poison ivy and puddles. We labored to the beach beyond the treacherous narrows, and fancied that the enormous, encroaching waves had pulled back slightly. At last! The outer beach of Cape Cod was ours, and ours alone. Our only companions were some harried-looking gulls and terns. Driftwood, sea lettuce, and Irish moss littered the thin strip between smashing waves and towering dunes. This was what I had come for and neither downpour nor zephyr could keep me from smiling. Mile followed mile and we reached an area of clay cliffs, gray and chocolate clays layered and exposed to the sea. Dangerous small avalanches of sand trembled down these hard deposits. Two hours earlier, this had been a death trap for any walkers. Now, we happened upon two reporters from the Cape Cod Times on their way to videotape the shipwreck. “Sebastian Junger called us this morning about it,” they told us, as if the writer of The Perfect Storm was the daily watchman of the Cape. They seemed daunted when we informed them that the piece we encountered waited an hour’s hard slog away. At the convergence of South and North Pamet Roads, we spotted our destination near where Thoreau found a “charity house.” A hundred yards up the road the managers of the Truro Youth Hostel greeted us warmly, and dry clothes and hot tea transformed us into tourists again. Still, Thoreau himself stayed in houses as he wandered, finding comfort and provisions amongst local fishing families. This communal inn would certainly seem familiar to him, and a friendlier one could not be found. Rain pelted the windows as darkness fell, but inside visitors from many nations cooked dinner, read books, and talked of sunnier days. Everyone asked us how far we had come and how far we had to go. Some had biked sections of the Cape, but seemed to think walking it a strange occupation. Certainly they shuddered at our tale of adventure, though any of them could have done it, perhaps more easily than we had. I wondered again at this disconnect. Stumbling upstairs from our bunks for pancakes and coffee, we rubbed our eyes at the hazy glow. Sun began to crack through the clouds and we dared to hope that despite the weather report the day would be fine. Yellow warblers and swallows played in the yard. Far off we could see the crashing waves beyond a pond that sends water west to the Bay. The hostel manager explained that during Junger’s “perfect storm” the sea crashed over the dunes and filled the huge kettle pond with salt. Leaving his hospitality, we stepped up the road a few hundred yards and turned right onto an unmarked dirt road, the old King’s Highway. The morning shone and birdsong accompanied us over the sandy, forested hill. Thoreau had walked this road, I knew, since at one time it was the only north-south thruway other than the beaches. Deer tracks crossed the road into small hollows and dells. The sweet smell of flowering beach plums put us right with the world. Sadly leaving the dirt path for macadam, we saw two partridges and a red bird, either a finch or tanager. An old man we met told us it was too early for tanagers, but had no solution to its identity. “Seems like hard work,” he said when we mentioned our journey. After lunch at a roadside café, we tramped down Great Hollow Road to the other shore. From the heights of the last dune we could see the entire sweep of the Bay, which seemed unnaturally calm after the wild Atlantic. Suddenly, as if prompted by our arrival, the temperature rose at least ten degrees, the sun broke through completely, and Amy and I stripped down to shorts and t-shirts for the first time. A few families wandered around on the narrow strip of sand in a daze, confused by the sudden appearance of fine weather. A few yards north of the mouth of the hollow we stopped and I read from Thoreau. He had been here in 1855 and seen dozens of purposely beached “blackfish” being carved up for blubber. “They were a smooth, shining black, like India-rubber, and had remarkably simple and lumpish forms for animated creatures, with a blunt round snout or head, whale-like, and simple stiff-looking flippers.” All we could see were some goldeneye ducks and cormorants, but we studied them contentedly nevertheless. We walked up the long arc of the beach, our destination in North Truro never seeming to grow closer. The steep dunes bloomed with daisies and beach roses. About a mile north of Great Hollow, the hard sand high up teemed with activity in the homes of bank swallows. Thoreau said, observing these small wonders, “I counted two hundred holes of the bank swallow within a space six rods long, and there were at least one thousand old birds within three times that distance, twittering over the surf. I have never associated them in my thoughts with the beach before.” Nor had we. Numerous species crossed our path that day, but it was impossible not to prefer the swallows’ aerial dance. Who cared that so many others had seen it before us? This was something new to us, and every time we made an observation along the path we felt a little more like pilgrims, or “holy land saunterers,” as Thoreau dubbed walkers. A fine mist enveloped the distant Provincetown and we prayed for the rain to hold off. Families on the beaches refused to leave despite the fog and a man in a small, rainbow-sailed boat tacked stubbornly in circles. At last, we turned off the smooth Bay beach and checked into the motel. My feet blossomed with raw blisters, the first in five years of difficult hikes in mountains and jungles. I thought back to the forgotten boots, hoping the mistake would not prevent me from enjoying the final and longest day, which would take us back east, to the turbulent ocean. We ate a quick breakfast and marched down the road by 9 a.m. A jealous fog continued to grip both land and sea. We walked north on 6A until a cross street allowed us to hop onto Route 6 and east on High Head Road. 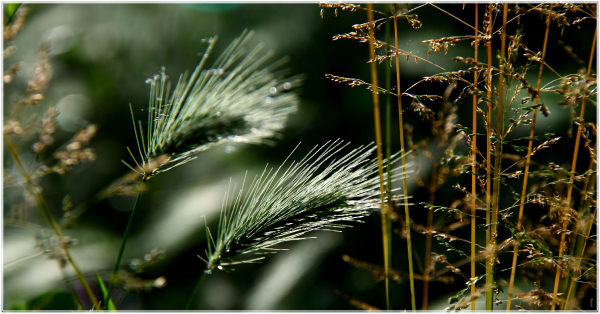 The flowering bushes and marsh reeds held the songs of innumerable birds. Red winged blackbirds and warblers zipped over the cordgrass and reeds. Two women, scientists of some sort, examined the marsh from a canoe. Walking sticks swinging cheerfully, we turned left and left again as the road devolved into sand. This track led into the fantastic duneland Thoreau called “the desert.” It seemed an alien world, full of strange environmental contradictions. A mottled toad hopped across the path and watched us, seemingly fearless. The sand showed no evidence of weeks of rain, but water vapor practically dripped from the air. The white ramparts of fog held on until we reached the beach, when the sun began to thrust valiantly through the fortifications. A horseshoe crab lay on its back nearby, and when Amy prodded it, the legs motored vainly. She picked it up and carried it down to the surf, where it happily kicked and scuttled into the ocean. “You won’t be breakfast today,” she called after it. Another hundred yards and we spotted our first seal. Its small coffee head popped up and down in the surf, and its sleek back slid over the surface as it dove for fish. As we continued, another appeared, and another. Dozens of seals were frolicking in the growing sunlight. Many watched us curiously, perhaps wondering why we weren’t enjoying a swim. At last the vapor burned off, and the blue of the water startled us. Far off breakers appeared, and a boat or two prodded the fishing grounds, seeming to follow the seals’ advice on where the best eating was to be found. A strange illusion of perspective that Thoreau often spoke of made it impossible to know how far we’d come. Clamshells looked like boulders and high dunes looked like sandcastles. There were no landmarks until we passed a small shelter at the high tide line. 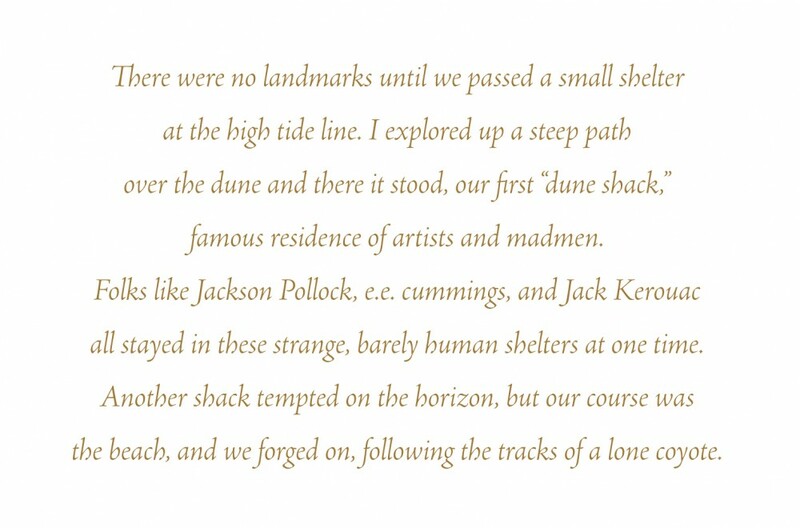 I explored up a steep path over the dune and there it stood, our first “dune shack,” famous residence of artists and madmen. Folks like Jackson Pollock, e.e. cummings, and Jack Kerouac all stayed in these strange, barely human shelters at one time. Another shack tempted on the horizon, but our course was the beach, and we forged on, following the tracks of a lone coyote. Another mile and we encountered our first humans of the day. Two women from Savannah, Georgia, Angela and Adrienn, sunned themselves on a blanket, enjoying the odd yellow orb in the sky. They offered us orange slices and we chatted. After five years trying, they had won a lottery for their dune shack, Thalassa, and had nearly regretted it when the terrible nor’easter rocked and shook it to its foundations. They had recovered now and seemed happy, telling us that they had seen whales with their binoculars that morning. “Good luck.” They waved and turned back to watch a pod of seals. We pushed on for another long, sandy mile or two, spotting piping plovers and terns protecting their surviving offspring. One small plover peeped and skittered along the dunes, barely the size of a golf ball. Amy sighed with relief that something had lived through the tempest. It was a day to be in love with life, and neither blisters nor sore muscles could spoil it. During a lunch of dried fruit and energy bars on the beach, with high tide licking our tired feet, we discussed the idea of exploration. I supposed the sacrifices of comfort made some unwilling to attempt it, while Amy asserted that the careful planning needed prevented most from going beyond “tourism.” “That’s why even more adventurous types use guided tours.” I shrugged. All this patting ourselves on the back was fine, but had we discovered anything beyond our own capacities? Reluctantly, we left our new friend and pressed on through the weird moonscape of the Provincelands. I used the compass to guide us toward the National Park center, navigating over steep ginger hills and through lakes of reindeer moss, following deer tracks. A coyote yelped at our approach somewhere in the dense thickets of scrub pines. These twisted pines eventually steered us west, and at last we stumbled onto the Race Point bike path. This took us up the dune to the Visitor Center, where we emptied sand from our sneakers before the last push down the last road. Refreshed, we clacked our sticks along under beeches and oaks, singing our marching song, heading for Provincetown. 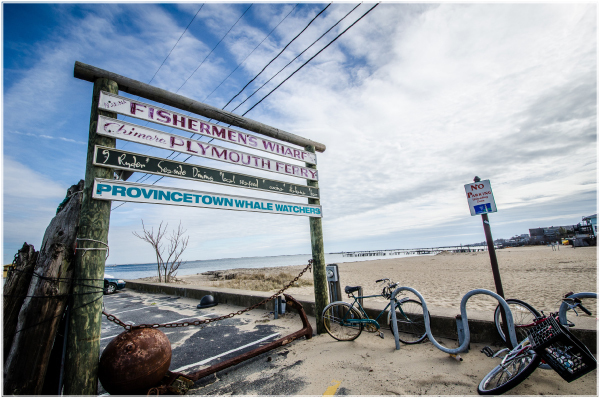 In Thoreau’s time this was a prosperous fishing village, assailed by the encroaching sands. “The houses, in which a more modern and pretending style has at length prevailed over the fisherman’s hut, stand on the inner or plank side of the street, and the fish and store houses, with the picturesque-looking windmills of the Saltworks, on the other side…The outward aspect of the houses and shops frequently suggested a poverty which their interior comfort and even richness disproved.” Now, brightly-colored houses and bed and breakfasts ushered us into what had clearly become a tourist village. On Commercial Street, in Thoreau’s time a four-planked walkway over sand, we spotted the Somerset House. Our hosts Dan and Bob welcomed us and offered a glass of local Truro Vineyards wine. We toasted our triumph and looked forward to a celebratory lobster dinner. In truth, though, the celebration was over. We did not “think more of the wine than the brine” as Thoreau put it. Exploration not vacation had opened our eyes to more than the beach roses. Finding the shipwreck was a palpable discovery. But what about sharing the shore with none but seals? Watching the dance of the bank swallows? Each plant or shell we studied and identified, each moment in time spent along a path we chose. And best of all, we felt those moments in the bones of our feet. The hard work led to the reward…no, it was the reward. The opportunity to see extraordinary things in novel and surprising ways was only a bonus. The next morning at the bus station, the driver asked us why we were leaving just at the commencement of the annual Portuguese Festival. “We wanted to avoid the tourists,” I said. “But you are the tourists,” he said with a grin, ignoring our walking sticks and pointing to our freshly bought Cape Cod t-shirts. Our tale of heroic hikes through blinding storms did not convince him otherwise. 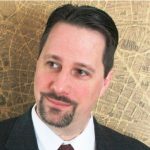 Eric D. Lehman is a travel and history writer, with reviews, essays, and stories in dozens of magazines and journals. 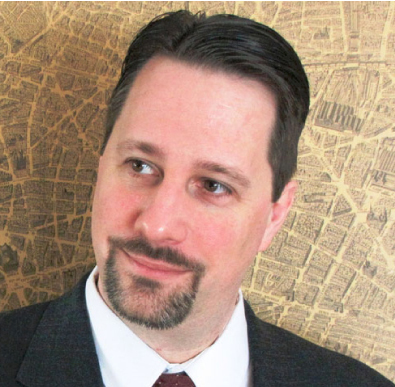 He is also an award-winning author of many books, including Afoot in Connecticut, The Foundation of Summer, A History of Connecticut Wine, Insiders’ Guide to Connecticut, A History of Connecticut Food, Becoming Tom Thumb, andHomegrown Terror. In his spare time, he pursues Henry Miller scholarship and teaches creative writing and literature at the University of Bridgeport, where he directs the school literary magazine, Groundswell, and the faculty essay series, The Commons. He lives in Hamden with his wife, poet Amy Nawrocki, and his two cats.